Market Rasen Town consolidated their top-three spot in East Lincs Combination Division Three on Saturday with a 9-0 demolition of struggling Alford Town Reserves. Tom Robinson’s hat-trick was the highlight at Rase Park, closely followed by a brace from Kieran Togher. Darren Salmon, George Wootton, Feranmi Olunloyo and substitute Nathan Smith also got on the scoresheet as Town recorded their sixth league win of the season. The win reduced the gap to leaders GB Kitchens to eight points, with a game in hand, after their 2-1 defeat at AFC Grainthorpe, and increased the gap to fourth-placed Louth Old Boys Vets to five points. But they remain four points behind second-placed Barnoldby who have played three games less and are yet to drop a point following their 4-1 win at Louth last weekend. 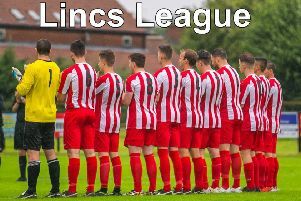 Town will hope to maintain their good run of form on Saturday when they travel to AFC Grainthorpe for a 2pm kick-off, having picked up five wins from the last six in league and cup.